The hires, quits, and layoffs rates all held fairly steady in the December Job Openings and Labor Turnover Survey (JOLTS). As you can see in the figure below, layoffs shot up during the recession but recovered quickly and have been at prerecession levels for more than three years. The fact that this trend continued in December is a good sign. That said, not only do layoffs need to come down before we see a full recovery in the labor market, but hiring needs to pick up. While the hires rate has been generally improving, it’s still below its prerecession level. The voluntary quits rate had been flat since February (1.8 percent), and saw a modest spike up in September to 2.0 percent, before falling to 1.9 percent in October and holding steady through December. A larger number of people voluntarily quitting their jobs indicates a strong labor market—one where workers are able to leave jobs that are not right for them and find new ones. In December, the quits rate was still 9.2 percent lower than it was in 2007, before the recession began. 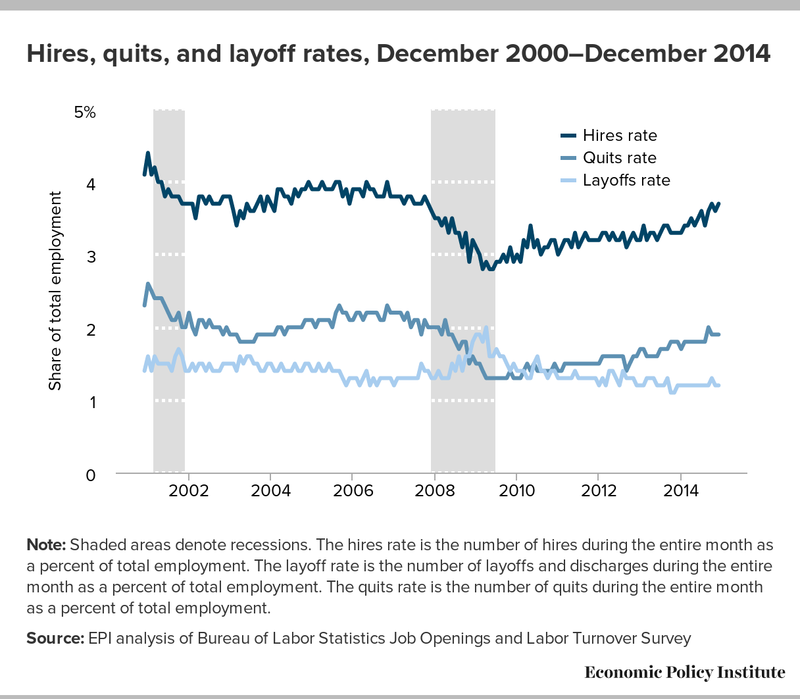 Over the year, the quits rate has averaged 1.8 percent, an improvement over its average rate of 1.4 percent in 2009 and 2010. Each consecutive year has seen modest improvement, an average increase in the quits rate of 0.1 percentage points per year. Before long, we should look for a return to pre-recession levels of voluntary quits, which would mean that fewer workers are locked into jobs they would leave if they could. Note: Shaded areas denote recessions. The hires rate is the number of hires during the entire month as a percent of total employment. The layoff rate is the number of layoffs and discharges during the entire month as a percent of total employment. The quits rate is the number of quits during the entire month as a percent of total employment.